Filled my stage 1 Noobed 2001 9-3 up earlier and reset the SID mpg before driving 6 miles on an A road at 55-60mph, no stops or steep hills & it showed 42.8mpg for the trip. Sounds very low for cruising in 5th at that speed? Sounds about right to me, you can just about get 50 if you're slip streaming milk floats. 6 miles really isn't long enough of a drive to get a good reading. If you did a much longer journey, you'd probably see it get higher than the 42.8 that you saw. Also, the trip computer isn't THAT accurate, you're better off brimming with fuel and then brimming it again after a journey to get a more accurate result. I had a standard 2001 Aero vert. Driving to the posted limited on A and B roads in mostly light traffic I did average fractionally over 44mpg but it was hard work feathering the throttle and using maximum anticipation. That was over 258 miles measured using the same petrol station and pump and using satnav as a measurement for mileage. I did several "economy" runs, that was the best I achieved. But as low as 15mph when having fun. What's the point In remapping, to not get the grin factor. Over a thankful I average 32-34, my commute is 6 miles A road 50-60mph, a mile through town then 10 miles motorway. I work shifts so rarely drive in heavy traffic. My 9-3 OG Vert AUTO seems to be pegged at 26mpg and I drive like grandma on a lazy day through the country. Think the brakes are on! Plenty of stories claiming that sort of mileage but thats just from complete dreamers. 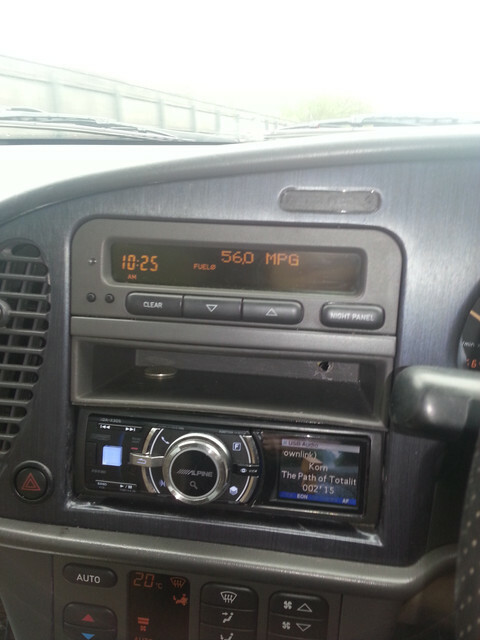 The Diesels cant manage that sort of MPG, there is no way a Petrol will achieve it. In very specific circumstances and over a short distance you may see close to 50MPG but in the real world anybody claiming they are achieving much more then 30MPG long term are just kidding themselves. Best real mpg i got was 35mpg on my stage 1, that was on long journeys. Normal for my daily drive was 26mpg, but it was a very short run. That was measured brim to brim on the tank. SID was frequently over reading by 5mpg or more. This was in a vert which has worse mpg than the hardtop. Just run around 550 miles in the OG9-3. Did not do a brim to brim but according to SID it was running at 39.5 up to the Wirral from Kent, mainly motorway at 60-65 (although much of the M6 is 50 limit). On the way back today I had the top down all the way, got stuck in traffic jams a few times including 45 mins+ jam to get in and out of Banbury for a quick stop and an accident holdup on the M25, plus crawling for miles around the Heathrow section, but did open up nearer home to 70+ on the M25/26 and A21. SID reported 37.5 at the end of it all which I did not think was bad. On a run I get about 30-32 mpg from the DE (2,0t auto estate) The 2,2 oil-burner (manual estate) we had before would do about 34 mpg on a similar run. I can't help but think topography plays a significant role. Round our way, you don't go very far without a change in altitude. Once I was coming back from Edinburgh with the intention of trying to get some decent mpg figures. I decided to travel at 60mph as far as reasonably practical. Going round the Edinburgh City Bypass the figures were looking good, well north of 40mpg. Then I turned off on the A68 and it all went south, as it were (pun intended!) Ended up around 30 mpg, driving like a nun. Just filled mine up this evening, SID gave an average reading of 32.4mpg, actual MPG full tank to full tank was 34.8. For some reason the diesels seem to vary from car to car. My regular work car often returns 50-55mpg week in and week out, fully loaded with tools. My wife's identical car barely achieved much above the low 40s, admittedly the engine destroyed itself not long after that. I noticed that my car has taken a significant hit since changing from 16" SE wheels to 17" Double Ys, at least 5mpg for some reason. Changing to winter wheels shortly, so let's see what happens then. Larger rotating mass and moment of inertia (where the mass is located vs the axis of rotation) needs more torque to give the same accelleration so you press the pedal harder? Shouldnt have thought the slightly larger wheels and tyres would have that big an effect though. Particularly where the larger sidewall profile of the tyres used on smaller wheels makes the overall rolling radius very similar.